community | Confessions of a Recovering P.K. I was sitting in a local coffee shop the other day and a couple came in looking for breakfast options. The guy behind the counter told them that their breakfast options were limited and then proceeded to tell them about a place down the street that had a more full breakfast menu. The couple thanked him and headed out the door to the little diner down the street. As I sat there, enthralled with what had just played out before me, I couldn’t help but think about the wisdom in knowing your limitations, in knowing what you can offer and what you can’t. This played out before me in a small little cafe, but I wondered why it doesn’t play out more in churches. In this church planting journey that I have been on, I’ve thought a lot about churches and what they can and can’t do. I’ve thought a lot about trying to be all things to all people. I’ve wondered what keeps pastors from being secure enough in who they are and who their church is to tell people who are looking for something that they won’t find there that it might not be the place for them. It’s far more tempting when new people come into your church to do your best to woo them and persuade them that this is the place for them, even if they are looking for something that you can’t give them. It’s far more difficult to be honest and tell them that you know a place that might be a better fit for them. I know that there are pastors out there who actually do that, recommend that people find what they’re looking for down the street, across town, or somewhere else. In the long run, knowing limitations, both personally and as a church, will help us be more effective. I’ve learned that over the past few years, improving in the area of delegation, not to get out of working but to free myself up to do the things that I do best. Why is it that pastors and churches struggle to do what this coffee shop attendant did? Why do we struggle to know our limitations, admit our limitations, and live into the things at which we excel? As I embark on this journey, what are the top reasons why I need to follow the example of this coffee shop attendant? I have a friend and mentor who planted a church years ago. His church has grown to be one of the largest in the area. While it might all seem like it came easily, he can share war stories and show the scars that he’s earned to get to the place where he is at. The one consistent story he has told is of the “vision wranglers” who came to the church with high expectations of what they were looking for and what they thought needed to be offered. Listening to them rather than pursuing the God given vision that you have been given will lead to a distorted vision and a confusing pursuit of that. If a decision making process is formed to analyze opportunities and offerings within a church to ensure that they are aligned with the vision, it will go a long way in not only preventing burnout but also enforcing, solidifying, and casting that vision. When people ask if you offer something and you answer, “That doesn’t really align with the vision that God has given us,” people might not like it, but they will know what that vision is and how it drives everything that you do as a church. I could write an entire post on strengths and my own journey in them, but for the sake of this post, I’ll keep it brief. Focusing on strengths is far more fulfilling than focusing on weaknesses. That’s not to say that God doesn’t call us to grow in areas of weakness and rely on him, but I firmly believe that we still need to lean into him even when we are operating in our strengths. Just because something is your strength doesn’t mean you do it perfectly. Focusing on the things that we are good at helps us be more effective and efficient as individuals. It makes sense that when we take it to a more corporate and communal level to the church that the same should be true. If we know the strengths of our faith community, we should live into them rather than trying to be like the other faith community down the street or across town. When we try to do the things that we aren’t good at, not only do we become less efficient and effective, we also suffer from an identity crisis. We fail to see who God has created us to be and long to be other than who he has made us. In our pursuit of another identity, we basically tell God that we’re not satisfied with who he made us and we’d much rather be something else. If the body of Christ is as diverse as Paul seems to describe it as in his letters, then maybe we aren’t all meant to do everything. There’s something to be said about a hand doing things that hands were meant to do. Same can be said of feet doing things that feet were meant to do. But an arm was never meant to smell, a leg was never meant to taste, a foot was never mean to see. Likewise, the nose, tongue, and eyes weren’t meant to do the things that arms, legs, and feet do. There is nothing wrong with acknowledging our limitations. In fact, I think that when we acknowledge those limitations, we begin to see just how vast and diverse the body of Christ is and appreciate the gifts of others. While we may still long to be something other than we are, if we humble ourselves, I think God can bring us to the place where we gain more appreciation for the gifts of others, especially when we know how hard it is to try to live into those things. At the same time, hopefully others come to that same place and begin to appreciate us and the gifts that God has given to us. This is all fine and good in theory, in fact, someone told me last week that I had a lot of theories. That’s part of the beauty of this journey I find myself on, theories will be tried and tested. They will be proved or disproved. The nice thing is that this is one theory that I’ve seen played out for me by others who have gone before, so theory or not, successful or not in my case, it’s been proven before. Ultimately, my heart is about being part of God’s kingdom work in this world. That’s not always easy, it’s not without challenges, but I think that it can go a long way towards removing some of those challenges when we begin to live in to who God has made us, both as individuals and communities, and let others live into who they are. If we find ourselves living into that, I think we will begin to see what many of us have prayed for over and over again, God’s kingdom coming and his will being done on earth as it is in heaven. A little more than four years ago, my community was rocked when a local police officer and his wife were out for a run and the wife was hit by a car and killed. The running community reacted. A memorial run was set up. A memorial license plate was created. An organization began. A legacy was left. Now, a little more than four years later, tragedy has struck my community again. A beloved preschool teacher was walking in her neighborhood and was hit by a car. Although she initially survived the accident, she eventually succumbed to her injuries. Again, a community reacts and responds. In the wake of the tragedy, I spoke to countless teachers who talked about the difficulties that have rippled through their school this year. Suicides. Attempted suicides. Sexual assaults. The list goes on. How much more could one community take, they asked? This is what seems to happen in a tight-knit community, tragedy strikes and the impact runs deep. Part of it is because of how the various neighborhoods in the community are set up. People live there because they want to be connected to each other. People live there because they want to know their neighbors. But there’s risk in that. When we love deeply, we hurt deeply. When tragedy strikes, it cuts deep into our hearts. This tragedy strikes my family harder than the last one. This woman was my oldest child’s preschool teacher years ago. For nine years, my three children went through that preschool. For nine years, although we didn’t have her more than one year, we were connected. She knew stories about me, from the mouth of my child, that others have probably never heard. When news hit me about her death, I was numb. In the middle of the night following, I awoke and lay restless in my bed. Her husband. Her children. Her family. My heart ached. What more could I do other than feel their pain and pray? In a day and age where we all seem connected yet aren’t always, the silver lining of the tragedy is that I see just how connected and tight-knit my community seems to be. I see people rallying around a family in need, a family who is hurting. I know that many people’s interest will wane as the headlines fade from the papers about the incident. Those closest to the family will journey with them for a time. The connections will remain. My heart hurts today. Many are hurting in the aftermath of this. But I’d be hard-pressed to believe that any who are hurting regretted their connections. Tennyson said that it’s better to have loved and lost than never to have loved at all. We were made for connection, we were made for relationship, to avoid relationship for the sake of avoiding pain will only result in the deeper pain of loneliness. I don’t know what more will come from this tragedy. I hope that there is more than the usual tears shed, meals delivered, flowers and cards sent, and then the resumption of normality for everyone not directly connected to the victim. We’re going through a series during Lent at my church on slowing down. It seems incredibly relevant on so many levels as I sit here and type this. Slowing down physically. Slowing down mentally. Slowing down emotionally. We need to slow down. We move too fast, and we certainly move too fast to really grieve our losses. I know that one from experience. Yes, pain cuts deep when we’re connected, but maybe we can slow down and ask ourselves just how this tragedy, and every tragedy that we face, experience, witness, or even hear about, will change the way that we live our lives. Will they make a difference or will we just return to the status quo as soon as the memories fade? It’s a question that we may speak as often as we hear it, but how often do we ask it with sincerity, sincerely wanting to know what’s going on with the person whom we’re asking? When someone asks it of us, how likely are we to give an honest answer or do legitimately think that, if we gave an honest answer, the person who was asking us really gave a rip? As I get older and the lens of what’s really important in life seems to become clearer, I continue to see that there are certain themes and principles that seem to apply across the board. No matter who you ask, no matter where you are, these things seem to be true. One of these things that I have come to appreciate and understand more and more over the past few years is the fact that you can never assume that what’s on the outside of the box matches what’s on the inside. In other words, when it comes to people, just because someone seems to be doing okay on the outside doesn’t mean that they aren’t hiding something….or, more accurately, not divulging what’s really going on for any one of a number of fears. For me, as a pastor, Sunday mornings can be among the busiest hours of my week. I am trying to make sure that everything is set. Whether I am preaching or leading the music team or whatever I might be doing, it can be an incredibly stressful hour. That’s not to say that I am not focused on the goal of that time or the importance of it, it just means that there are other things that I need to maneuver through to get focused on just why I am there. But it can be easy for me to casually cast off a “How are you?” here and there without really thinking through what I’m really asking or, worse yet, without really wanting to know or hear the answer. Like I said, though, one thing that I am coming to realize more and more every day is that there can be far more going on beneath the surface than the casual “How are you?” with the obligatory “Good” or “Fine” retort actually shows. And I wonder just how many people answer the question honestly and really feel that they can answer the question honestly. If I answer honestly, will the person asking even care? If they care and I’m honest, will they tell the world about what’s going on in my life? If they find out what’s really going on in my life, will they shun me and make me feel as isolated as I already feel? I’ve come to realize that just because someone answers that they’re doing good or fine or whatever, that doesn’t necessarily mean that’s an honest answer. And so it’s forcing me to pay attention and to listen. How do people carry themselves? Are their words and answers matching their body language? Are they dropping any subtle hints about what’s lying beneath the surface as I speak with them? Because I can get so caught up in the goal and the endgame, I can easily forget about the people involved in accomplishing and achieving that goal. When I do that, it cheapens the relationships that I have that are far more important than that would indicate. The last thing that I want is for the people around me to think that they are just cogs in a system of simply getting to the end. I wouldn’t want to feel like that, so why should I think that anyone else would want that either? No, things aren’t always what they seem. There is usually so much more lurking beneath the surface, but it takes intention, patience, love, empathy, care, and time to really get there. People aren’t going to share it right out of the gate. They need to know that they can trust you, they need to know that you won’t betray their confidence, and they need to know that you really, truly, genuinely care about them and what’s really going on in their lives. I’m learning, I’m growing, and I’m trying to do better here. I’m working to make sure that if I ask someone “How are you?” that I am ready for whatever kind of answer they might return to me. I might not always like the answer, I might not always feel like I’ve got the time for the answer, but to not listen and care about the answer is to allow someone to float off all alone out there in the world. We can make a difference when we listen and pay attention. We can make a difference when we legitimately ask the question and want to know the answer. I know that when I’ve done it with genuine concern, it’s made a huge difference to the people to know that someone is paying attention and someone cares. I know that there have been times when the question has been asked of me and I probably gave more of an answer than the person was expecting, but in the end, it made all the difference in the world for me to be heard and to know that someone really cared. Throughout “Me Too” Weece vamps on a variety of topics. He uses personal stories to connect to the message that he’s telling here. He goes to the Gospels to share stories about Jesus and how he met people where they were, just like he meets you and me. His writing style is comfortable and he easily draws in his reader, making them feel as if they’re engaged in a conversation with an old friend at a coffee shop. He never comes across preachy, judgmental, or in a rush, it’s as if the reader is the only person in the world with whom he wants to have a conversation as he weaves through page after page. There’s nothing deeply theological here, no material for deep Bible study or even further research. This book was a quick read for me. Not only did it draw me in once I started reading, it kept me engaged and I had a hard time putting it down. Weece shares his wisdom and wit and the reader is left with a book that makes you smile, laugh, cry, and think. Sometimes, we just have to read books like this, for no other reason other than that we need to be reminded that we are not alone, that God wants to know us more, and that there are others who can relate to us as they say, “me too” when they hear us tell our stories. “Me Too” was worth the read. It didn’t take long to get through it and it felt like time well spent to just be reminded of the many things that Weece reminds the reader of throughout this book. If you’re looking for something deep and theological, you won’t find it here, but if you find yourself in a place where you need to be lifted up and reminded of the good God who created us and desires to know us, “Me Too” may be just the thing that you’ve been looking for. I was talking to a good friend the other day who recently went through a difficult time with a Christian organization for whom he worked. He was recounting the hurt that he experienced and was telling me about his new job. While he was incredibly encouraged that he found a new job, it’s not in his “wheelhouse” and it sounds like it’s going to drain him if he doesn’t find something more satisfying. He said that one of the hardest things that he was experiencing was the fact that people just assumed that since he found another job, everything was fine. It made me think of the grieving process and the above quote. When there is a loss or pain or hurt, it’s natural for the rest of the world to move past it once the initial shock of the situation wears off. But that same movement that happens for everyone else doesn’t happen quite as easily for those who have actually experienced the loss or pain or hurt. The world continues to turn and people’s lives go back to their own sense of normality, but loss, pain, and hurt have a way of leaving their victims to hold the fragile pieces of their lives in their hands and wonder how to piece them together again. I’ve been through my fair share of loss, grief, and disappointment. During those times, I discovered this truth and tried my best to navigate through what have become the societal norms when it comes to coping. It seems that we don’t know how to slow down well. We don’t know how to simply sit in our pain. Worse yet, we don’t know how to sit with others in their pain either. Those are two words that seem so simple and yet our ability to not only grasp them but to put them into practice seems elusive. They’re not hard words to understand but they’re hard words to follow. How do we find time in the midst of all that we have filled our schedules with to stop and process? More practically, how do we find the balance between completely ignoring the pain and letting it overwhelm and consume us? God is bigger than my loss. God is bigger than my pain. God is bigger than my hurt. While I believe all those things, they too are hard to actually move from simple assent to full on embrace. How do I take those statements and allow them to be more than trite and superficial advice? We’ve got to put one foot in front of the other, one step at a time, moment by moment of each day. Like the Israelites journey through the wilderness, the path which we take seems more directed by circumstances or chaos than it is defined by order and understanding. While the shortest distance between two points is a straight line, life rarely affords us straight line paths through grief and pain and hurt. The ones who understand this best are the ones who have experienced it the most. While there are highly empathic people on this earth, the ones who can understand this the best are the ones who have actually walked their own road, finding out for themselves that straight lines are overrated and journeys rarely go as the AAA Triptik tells us they should, especially through such unstable and unpredictable situations as grief or loss or pain. We are created for community and we will find comfort and solace when we find others with whom we can share our experiences. We are a gift to each other and we can’t forget that we need others as much (if not more) than they need us. We will continue to experience loss and pain and grief, that’s part of life in a broken and fallen world, but we need not experience it alone. We can help others to remind them and ourselves how important it is to let the current take you rather than fighting it. It may be a wild ride and it won’t always be fun, but when the journey is through, we will be wiser to share what we have learned with those around us. In light of recent events in the United States, both recently and in the past few years, there can be no denying that there is a struggle when it comes to our differences. When we differ in our ideology and our beliefs, what do we let that difference do to us? Are we motivated to bridge those differences and find commonality or do we simply seek sameness? In his book “A Fellowship of Differents,” Scott McKnight examines the differences between us. He looks at what the church is supposed to be and what the church has become. McKnight presents a salad bowl as imagery to what the church should be. We are to be mixed up, combined together into a glorious mess, a conglomeration of different working together with their similarities. McKnight presents his own experience of church as well as the experience presented us within the biblical narrative. He reminds the read that there has never been a “golden era” of church despite the fact that many will try to convince you that the church in Acts and the early 1st century was perfect or near perfect. He asks questions to get us to look at what we see to determine whether or not it is what we should be seeing. Carrying out the salad analogy, he wonders whether we have smothered our differences and become ingrown, rendering invisible, ignored, shelved, or AWOL any who don’t fit into the norms that we present. In seeking to come together as a fellowship of different, McKnight calls the church to this its biggest challenge. In seeking to become this salad, this fellowship of different, McKnight calls the church to six themes that are to be central in order to live out the Christian life: grace, love, table, holiness, newness, and flourishing. He divides the book into these six sections and thoroughly unpacks them. McKnight writes that, “Christians are too often addicted to stories of dramatic and extraordinary grace. We love the big story such as Paul’s – but grace isn’t just found in the dramatic.” He explains that grace is meted out in the everyday miracles, in the transformative affect that is seen in the common and mundane. Grace is God’s love reaching us because of what he has done rather than what we have done. It is God’s big “Yes” to us. Beyond grace is love, a love that has been distorted in our societal definitions. There is the love which is thrown around in our everyday language and then there is the love of which we read in Scripture, the two of which are distinct and different. Love is simple when we are called to love those like us, but what of live when we need to love those unlike us? Since our culture dominates the definition of love, it is no wonder that Christians within the church struggle to understand it in their marriages, their families, their relationships, and in their salad bowl churches. Love, as described in our dictionary, “has no final goal other than perhaps the personal happiness of the one loved or the one who loves – as long as that lasts. But Christian love has direction.” Christian love is both directional and sacrificial and, as C.S. Lewis writes, “To love at all is to be vulnerable.” Love is seldom easy and it seldom comes without a price. Many point back to the Constantine’s conversion and decision to make Christianity the public religion as a momentous occasion in the life of Christianity. While that momentous occasion may have held some positive aspects, it is more often than not pointed at as a misstep that elevated Christianity in ways that may have led us to this place of comfort, norms, and homogeneity. Knight points to Roger Williams and Henry David Thoreau as two other influencers of what Christianity in the United States has become. These two individuals, McKnight posits, have contributed to the individualism and “Me” centered ideology of the American church. This individualism takes away from the “We” language that we see throughout the New Testament as the Church was established. McKnight delves into a discussion of holiness and how that word garners fear and criticism from many. He cautions to not turn the grand idea of holiness into a legalistic list of “Don’ts” while leaving off the “Do’s.” He adds that, “Holiness cannot be reduced to separation or difference.” Holiness is not something that we make ourselves into but something that we are made into by God. We seek to live lives that avoid sin and is devoted to God. McKnight enters into a discussion on sexuality because it is hard to engage in a talk about the modern church without addressing this issue. In my opinion, he presents well the argument in favor of biblical marriage and promotes the ideas of celibacy and faithfulness which Paul supports. McKnight makes it clear that love is not based on whether or not you do what I want nor is it based on toleration, leaving one another alone. Love, he suggests, involves presence, advocacy, and companionship over time, it is a long-term commitment. McKnight proposes a third way when it comes to sexuality, suggesting that our salvation and sanctification are processes which we will not complete until we have fully arrived in glory. We must seek to allow ourselves to be transformed by grace and in holiness in order that we all might become what God wants us to be. He says, “We are washed, we are waiting, and in the meantime we are striving to be holy and loving.” While much more could have been said about the subject, I understand that McKnight was limited within the context of this book. However, his brief discussion is helpful to stir up conversation and pondering rather than to act as a gauntlet thrown in victory and defiance. We seek liberty which does not necessarily mean license. Instead, liberty of the Christian kind is constrained by love. Knowing that we are all in a process and that are redemption is not complete until the kingdom, we look to love one another not as we are but as we will be made when we are in that kingdom together for eternity. As I see it, it’s not a statement of passive toleration from McKnight but rather a call to embrace each other as we walk together towards sanctification and transformation. We, as the Church, need to be a people who are counter-cultural in our lives because we are led and empowered by the Holy Spirit. We only live and serve as an example when we are led in and by a power that is not our own. McKnight challenges the church to expose themselves to the Holy Spirit because the single biggest influence in our lives is that which we expose ourselves to the most. Exposure to the Holy Spirit helps to birth the fruit of the Spirit within us. Ultimately, as followers of Christ, we are called to suffering and trials. Being a culture and fellowship of different may very well mean that we are called to those sufferings and trials of which Christ spoke and which Christ, Paul, and many others have experienced. But those sufferings and those trials actually give us opportunities to exhibit a counter-cultural love, a love that is sacrificial, a love that calls us to look at others before we look at ourselves. While I have not read all of McKnight’s work, I have read enough to have constantly marveled at his gift of communication. I find myself nodding my head in agreement with him as I read through what he writes. I find myself challenged by what he writes in a way that convicts and spurs me on, not leaving me bristling because of his gracious way of asking questions and challenging. As I read “A Fellowship of Differents,” I felt myself being stirred within. Much of what McKnight has written aligns with where my heart has been in recent months and years. I am grateful for McKnight’s gift if challenging while sharing of his own challenges in a humble manner. 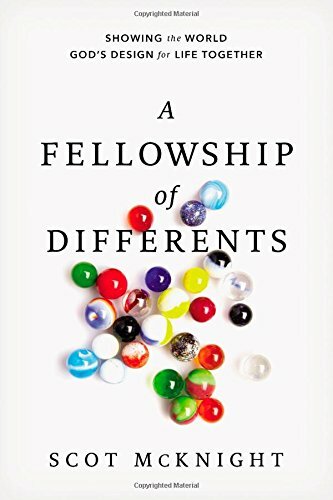 If you have struggled with the sameness which seems pervasive within the evangelical American church, “A Fellowship of DIfferents” is a must read. You will be challenged, you will be encouraged, and most importantly, you will be changed and transformed. Life has been interesting over the last few weeks. My two oldest children finished their school year and the next day, I had nose and sinus surgery. The recovery hasn’t been awful, but trying to slow down for recovery in the midst of a busy life is always a challenge. The denomination of which I am a part hosts their annual gathering every year in June. As it is a national organization with churches from around the 50 states (and beyond), they try to change the location up every year to accommodate for everyone. Last year, it was in Knoxville, Tennessee. This year, it’s in Orlando, Florida. They also try to make the gathering family friendly, providing opportunities for the entire family during the time together. So, this year, we decided to take the whole family. We also decided that we would take two days to get down to Orlando, although we could do it in just one. Last year, we came down for a Disney vacation and we took two days getting down and it seemed like it worked out well. So, after church on Sunday, we set off on our way. As I was still recovering from my surgery, I hadn’t contributed much to the growing list that my wife had been making for the trip. I was feeling a little out of it still and I was a little overwhelmed with other stuff that was happening around me. So, my wife had done a lot of solo planning as the day drew nearer for our departure. With three young children, it’s not unusual for us to turn back home for something that’s been forgotten as we start our trips. It’s actually one good reason that we need to use checklists when we go on trips like this, it helps us save time in the long run. It wasn’t a surprise for us then, when we made it two blocks and had to turn around. It was a little bit more of a surprise when we got just north of the City of Richmond and we headed home for the camera. I’ve made enough trips in my day to begin to be a little bit more patient with myself and with my family for forgotten items. Some things can be replaced at Target or WalMart for a limited price, but others just require you to turn around and go home. I thought that the camera was one of them. When we finally got on our way the third time, I settled into the driver’s seat and called a friend who is contemplating a move to Richmond. As we were talking, I noticed smoke in my rearview mirror that seemed to be coming from our van. I also noticed that the van was revving much higher than normal. I excused myself from my phone call and pulled off the highway. As I made my way into the gas station that was conveniently located at the end of the exit ramp, I smiled to myself as I pulled out of my AAA card at the fact that I had actually looked at that same card weeks earlier and asked myself, “Does it really make sense for us to keep paying for this?” Little did I know! A tow truck came in about 20 minutes and drove us back home. Because of our multiple false starts, we were actually closer to home than we would have been had we not forgotten cameras and other things. I also realized that my rebuilt transmission was most likely still under warranty. I was remaining surprisingly calm despite the unexpected and unpredictable circumstances, fairly uncharacteristic of me. Our tow truck had his wife with him and they were both very cordial to my family. While I was more calm than usual, my kids were panicking a little bit. They didn’t really know what I was going to be up to for the majority of our trip, all they knew was that the trip would end with them at Lego Land. My youngest was the most distraught, not completely understanding that other options were available for us to get to Florida. One thing that my wife and I have said multiple times in multiple circumstances over the nearly eight years that we have been in our community is that we have never experienced anything like it before. Having had two of our three children in those eight years as well as finishing seminary, losing both of my parents, going through a church split, and experiencing various other events, we have always, always, always experienced the grace and generosity of the people with whom we are closest……and even some who we haven’t really had the chance to get to know well yet. Within an hour of getting home after being picked up at the mechanic from my lead pastor, we had four different offers for vehicles to take to Florida. Four. People knew where we were headed, and they still were willing to let us take their various vehicles on this Griswold-esque road trip. While three of the offers were from closer friends, one was from a friend who I’ve only begun to get to know. He has actually gone through a lot himself in the past year or so, yet his willingness to be so kind and generous had left me speechless. He was willing to give to our family to get us out of a bind. Like so many things in life, there’s way more to the story than just that, but the bottom line is that less than 24 hours after being delayed, we were back on our way. Another 24 hours after that, I received word that our transmission was indeed still covered under the warranty. As I made my way towards Orlando after that phone call, I recounted the past days of events. Detours and delays. Acts of kindness and generosity. It all made me smile and I found it hard to believe that someone might think that there was no such thing as God. I am part of a small group of people from my church that meets a few times a month. Over the last few months, I was fascinated to hear people share their stories with me and with each other. There really were no hard ground rules of what to share or how to share it, so it was pretty cool to see what people felt were the most important aspects of their lives to share with everyone. When I grew up, this idea of sharing stories of what God was doing and had done was called sharing one’s testimony, but I think we need to call it what it is, a story of how God has met them and how their lives have intersected with him. One of the predominant themes that I have seen over and over as have interacted and ministered to and with people is our need for community. People who were not raised within the church talk about seeing something different in the people around them. They appreciated many other things, but there seemed to be an overwhelming need for community, for being known. At the base of who we all are, I think one of the things that we all crave at our core is the need to be known and to know others. Surficial and shallow relationships can easily be found. Heck, social media can be a successful way of allowing us to think that we know others and are known by others while never making eye contact or engaging in a face to face conversation. That’s not to say that social media is wrong, but it acts as a cheap substitute if we fail to realize that relationships need to be built at a much deeper level than this. If the only relationships that we have are with people who only exist to us on a computer screen, we will begin to see it change us. The church where I serve has been really good about creating a support structure for its pastors. Each pastor is given a group of three people who will come alongside them to encourage, support, and coach them along. In the nearly seven years that I have been with this group of people, I am on my third iteration of this group. When I first met with my current group, they let me talk and I wandered all around, in a verbal sense, until the end of our meeting. At that time, the two who were there began to tell me some of their observations. I sat there and was stunned but grateful as they both began to describe me and articulate their own understanding of who I was. There was a sense of accomplishment and arrival for me as they talked, knowing that I had well articulated who I was but even more grateful that they had listened, observed, and acknowledged that I was who I said that I was. I have had a number of people who I have worked for in past years who did not understand me. With a few engineering degrees and one theology degree under my belt, I also have an artistic side that people are more often exposed to than the analytical side of me. Getting into my head could prove frustrating and confusing for some people who like order and structure. While there is that side of me, the creative side of me rebels against it at times and I come across as flighty and aloof. For these guys who have been called to support me to see that and hear my own acknowledgement of my weaknesses in our first meeting together was a gift for me. I went home expressing to my wife my gratitude for these men who were willing to take time to enter into my story and try to understand me better. There are few things more frustrating to me than being misunderstood, but understanding and being understood takes time. It is an investment that sometimes doesn’t seem to be worth the effort that it takes. Yet, when we take the time to invest, to listen, and to observe, we can help a person know that they are being known and being understood. We can help others see how valuable they are and know that there is at least someone out there who understands them on a deeper level than just what’s on the surface. I am grateful for the people that have been placed in my life who understand me, who “get” me. I am sure that it hasn’t always been an easy ride for them to get to this point, but how thankful I am that they took the time to do this. As I think about them, it helps me to extend grace and show patience in taking the time to know and understand others. It’s an investment that I am not always willing to make, but I am growing, I am learning. To know and be known has been such an important part of my own growth, progress, and transformation and my hope and prayer is that taking the time to do that for others can be as equally beneficial to them as it has been when others have done that for me. We weren’t made to be alone. No, I’m not saying that to promote the end of singleness. I’m saying it because we are relational creatures, made in the image of God to be with one another. The moment that we begin to sequester ourselves from others is the minute that we not only begin to set ourselves up for a fall, but also when we live out of sequence with the intention of the One who created us. You can learn an awful lot by watching your kids. My 2 oldest kids are only 23 months apart from each other. While we have had our fair share of challenging days, we’ve also begun to see the benefits of the natural relationship that forms over time with the two of them. While my wife was putting our youngest to bed on an evening when I had a meeting, she left the 2 older children downstairs to occupy themselves quietly. After successfully getting the youngest one to sleep, my wife returned downstairs to find that the oldest had chosen a movie, loaded it into the DVD player, set everything up, and even brought his brother a snack for the movie-watching experience. What a pleasant surprise takes place when your kids are actually learning some of the things that you have been trying to teach them all along. When I made an anniversary video for my wife for our 10th anniversary, I used Jack Johnson’s song “Better Together” as one of the background songs. Over the course of 10 years, my wife and I were constantly reminded that we do things better together. We get more done cooperatively and we have fun in the process, especially if it’s a task that we’re not necessarily crazy about doing on our own. We can find countless stories within the Bible of what happens to people when they spend too much time alone (the story of David and Bathsheba comes to mind). I’m not recommending that all of the introverts of the world rebel against their natural tendencies to be reserved and quiet, but I am recommending that we come to the realization that we need each other. We need support. We need encouragement. We need prayer. We need loving arms. We need sturdy shoulders. We need each other. We are a gift to each other, given by God not to selfishly consume, but to lovingly and graciously give. That’s what Jesus did. I can’t imagine the number of times that he would probably have liked to tell the disciples to just leave him alone so that he could have a few moments of peace, but instead, he loved them and gave himself to them. What am I doing to give of myself to others? My children? My wife? My friends? The people who need me most? What am I doing to live out the truth that we are better together?